Your Academic Footprint | Exciting Adventures of an ex-Archaeologist, soon to be Teacher! I haven’t had a blog rant for a while so here goes, todays topic is Your Academic Footprint. In an age when your online presence is arguably as important as your offline being when it comes to career progression, how can you maintain academic credibility when websites for projects disappear? The inspiration for this post is personal. I have worked on a number of short to medium lived archaeology projects where amongst the many outputs was often a website. Huge amounts of time, effort and money were spent on these projects and the websites they created represented not only archaeological knowledge for all to access but a snapshot of the thinking and methodology of the time. 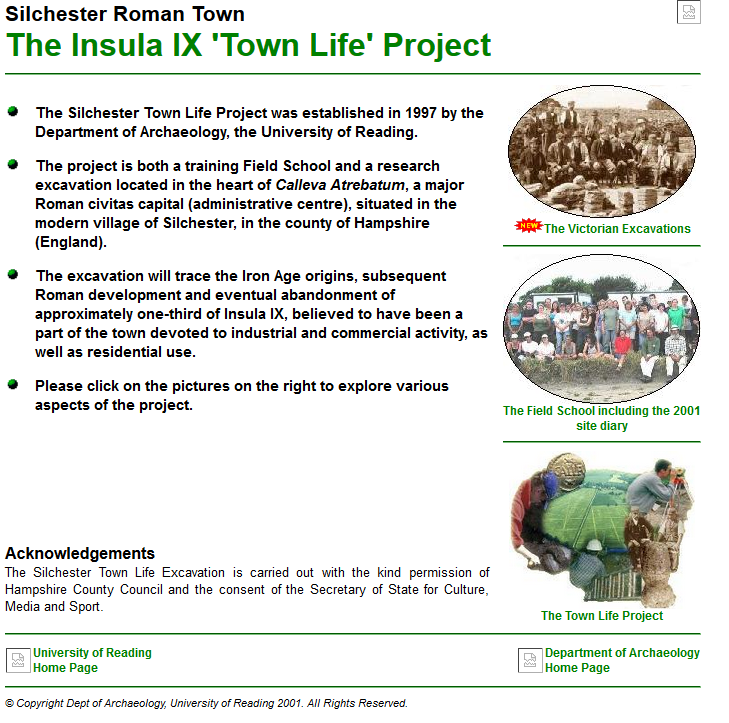 Case study number one comes from the University of Reading and the Silchester project. The Silchester website was first created in 2001 and consisted of a few static pages. They did the job, containing practical information on how to get to the site and what students might expect from the field school. 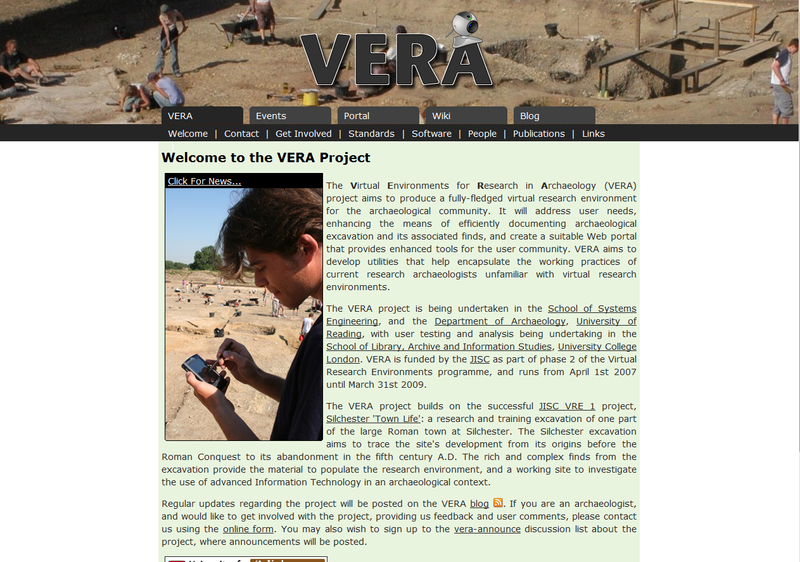 I joined the team in 2007 as the Archaeological Project Assistant on the Virtual Environments for Research in Archaeology (VERA) project. Part of my work involved redesigning the website and so, in time for the 2008 fieldschool, the project ended up building one in Drupal. It introduced lots more archaeological content, you could download old site reports, browse through photo galleries, use embedded features like weather and map widgets, share interesting content to new and exciting places like Twitter and Facebook (! ), leave comments, ask questions and generally immerse yourself in the life of the archaeologists involved with the project. The audience for this new website included protective students, current students, staff, researchers from around the world – it was widely hailed as an informative and pretty website which did a great job of showcasing the archaeology. The Silchester site won the award for the clean, easy to use design, the wealth of information available. The additional information is constantly changing, tapping into web 2.o and allowing the user to feel that this is a dynamic website, such as the well written blogs, images and finds gallery. The Virtual Environments for Research in Archaeology section, is a welcome addition, informing people a new direction in technology and archaeology, and inclusive of researchers and professionals as well as the public, who are well catered for on the site. A site to emulate. I am currently on an archaeological career break. Becoming a mummy a few years ago means I’ve had to delve into the world of the more stable workplace. I love my current job and I can see myself in it for another wee while, but not forever. I want to return to Archaeology and Heritage in the next few years, and if it had any sense, that world would want me and my skills and experience back. I keep an up to date CV in case I see something and, here speaks the digital curator in me, I periodically check the links it contains. As you can see if you visit vera.rdg.ac.uk. or silchester.rdg.ac.uk, most of my work is now gone. VERA has been replaced by a pile of 404 signs or timeouts. The Silchester website still exists but in a very different form – it has in my eyes sufffered, but others may disagree. The website has now been got by the branding people at University, and imposing the corporate look and structure. Websites taken down at some point after the project ended, but not straight away – lulling readers into the false sense of security that they would be there next time you wanted to look. No warning given, I suppose the people doing the unplugging wouldn’t know who to warn. The end result is that there is very little to show for years of my work, other than the memories that lie with some colleagues that “Oh yes, Emma. She did a good job of that she did.”. If you look closely, there is some evidence that these websites aren’t just a figment of my imagination. The Silchester YouTube channel (including my old https://www.youtube.com/user/SilchesterExcavation) and Twitter account are still going strong, for example. Contrast this with somewhere else I have worked, the Archaeology Data Service and Internet Archaeology. Perhaps unsurprisingly, given what they do, they have proof for all to see that I have worked there and done *stuff*. You can go to the staff pages and my name is still there, (although since I first though about writing this post, even the acknowledgement pages of IA have changed! ), you can see the staff updates page to see where I went next, I am thanked by authors of papers etc. The result is that if a potential employer really wanted to check my work, they could make a good start just with a simple web search. I know that change is inevitable, and that not all project websites can be maintained forever, but I’m struggling to see a solution. Short of attaching print outs of screenshots or old excavation reports to my cv, or directing potential employers to look at the wonderful wayback machine, how I can I prove these things ever existed? Do I take the URLS out of my CV? I guess that at the end of the day, my web footprint isn’t everything and my CV should be enough to convince people to give me an interview (well, you’d hope!) but it would be nice to have a but more substance to things. Thankfully, ScARF is still going strong and with this now being the Year of Archaeology and DigIt! 2015 somne of my more recent work will hopefully be around for a while. Thoughts? Comments? How does this affect you? Is Archaeology and Heritage particularly susceptible because of the way projects are funded?